In an exclusive interview, co-author Robert O. Bucholz explains why he and Joseph P. Ward chose to focus on this particular period in the history on this capital city. Can you summarise the subject of your book, and what inspired you to write? Our subject is how London became (arguably) the greatest city in the Western world, the inventor of much of modernity, and therefore a city worthy of hosting the Olympics. We wrote it because there really is no other book that examines this subject comprehensively for this period. More specifically, this is the first and only book about late Tudor, Stuart and early Hanoverian London — the London of Henry VIII, Queen Elizabeth, and Charles II; Shakespeare, Moll Cut-purse, Samuel Pepys, and Daniel Defoe’s Moll Flanders; Sir Isaac Newton and Sir Christopher Wren. Why did you choose to write about this particular period in London’s history? We argue that this was the most interesting time in London’s history for between 1550 and 1750, London grew from the moderately sized capital (about 50,000 people) of a 2nd rate country into the biggest city in Europe (700,000 people), the capital of the British Empire, a nexus of finance, trade and culture that it remains today. Indeed, we argue that it was in London that many of the hallmarks of modernity got their start, received their perfection, or were popularised for the Anglophone world. These included constitutional monarchy, participatory democracy, modern government finance, an effective civil service, a relatively free press, the first commercial concerts of music, the first viable commercial theatre since ancient times, novels, newspapers, clubs, insurance, decent street-lighting, three-piece suits for men, etc., etc. With the possible exception of Amsterdam, no other city on the planet did more to catalyse modernity. What was life like for Londoners during this period of growth? Perhaps the most remarkable thing about the growth of London was that it was itself a very unhealthy and sometimes dangerous place: plague, influenza, fire and building collapses killed more people than were born. Which means that London grew because of immigration: from English villages, Ireland, Scotland, the continent and eventually Africa and the Americas. All those newcomers to London, when they did not die, became Londoners and, along the way, forged the world’s first modern city by pursuing new forms of trade and finance, by patronising with coffeehouses and clubs and the world’s first relatively free press, etc. They faced age old problems of cities — poverty, crime, riot, disease — in new ways, like the London Foundling Hospital. Clearly, early modern Londoners were resilient. Every 20 years or so between a tenth and a fifth of the population succumbed to plague, culminating in the Great Plague of 1665 which killed perhaps 100,0000 out of less than 500,000. The following year the whole of central London burned in the Great Fire of 1666. And the year after that, the Dutch sailed up the Thames and sank much of the Royal Navy. But Londoners did not fold. Instead, led by visionaries like Sir Christopher Wren and Nicholas Barbon, they rebuilt their city more magnificent than before, its new, neo-classical and, imperial style culminating in Wren’s St. Paul’s Cathedral. A central theme of your book is ‘integration’ – could you explain more? Uniquely, our book integrates popular and elite cultures (the theatre and the coffee house; court drawing rooms and riot); court and city; pre-1640 and post-1640. Most historians who specialize in the period don’t cross those divides; the big surveys of London covering the whole of its history are wonderful but too unwieldy, while ours is sweeping and yet focused on the crucial period. Historians are going to consider it a very useful reference; literary scholars will appreciate the context it provides; teachers of university classes will finally have a book they can assign; and the general reader will find it fascinating and approachable. The book is full of illustrations and ‘walking tours’ – why did you feel this was important? What are the contemporary connections to this period? There are frequent topical references in the book, the London riots of 2011; Big Bang of 1986; contemporary urban fears of crime and poverty. In 2005 Ken Livingstone spoke eloquently about all the world’s people coming to London. That was true in our period too. It was in our period that London became a major financial centre – as it is today – and became one of the world’s great publishing and cultural centres (if you want to understand the context of the Old Globe/New Globe Theatre, read our book). 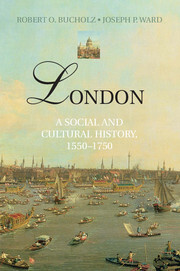 Robert O. Bucholz is the co-author of ‘London: A Social and Cultural History 1550-1750’. He is Professor of History at Loyola University in Chicago.